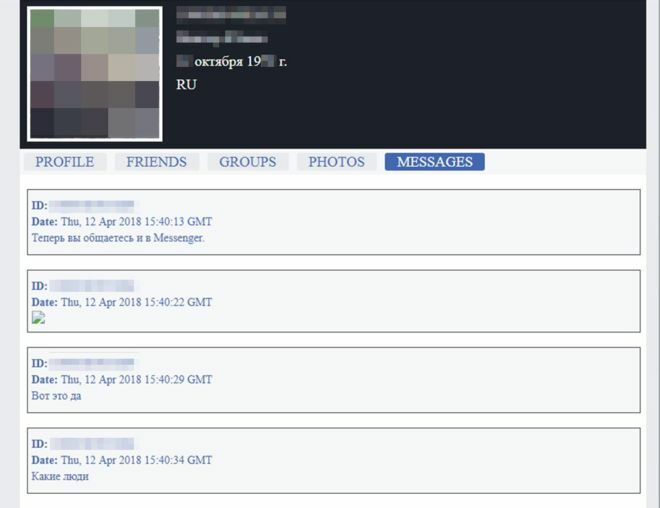 A user called FBSaler is offering personal data for Facebook users at $0.10 each, claiming to have account data from 120,000,000 users to offer; to prove that they have the goods, they've dumped the private messages sent by 81,000 Facebook users; and account data from 176,000. Facebook says the data wasn't breached from its servers: it blames malicious browser plugins for sucking this data directly out of users' computers. An independent security firm, Digital Shadows, has verified that the leaked messages and account data are real, though it may be that the account data was scraped from public data posted by Facebook users, rather than breached (whether by hacking Facebook's servers or its users' browsers). The sample data (which was been taken down) was hosted on a server that appeared to be located in St Petersburg, Russia. The accounts seemed to mostly belong to Russian and Ukrainian users, with a smattering of US, Brazilian, British and other users.